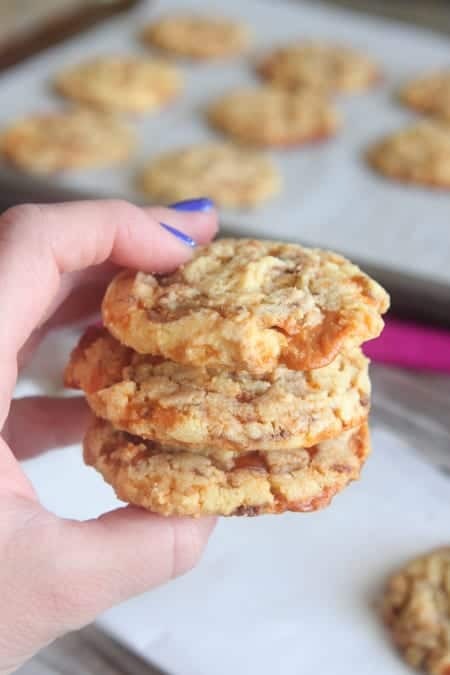 Butterfinger Cake Cookies- The Perfect Cake Mix Cookies! 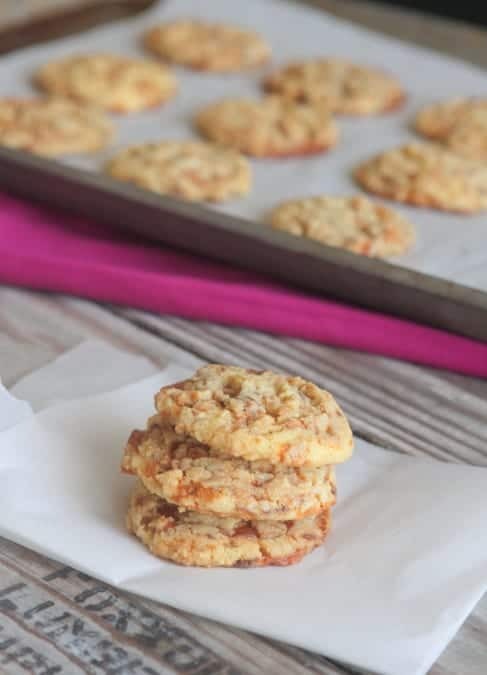 These Butterfinger Cake Cookies are so simple and a huge hit at every gathering! The perfect cake mix cookies! 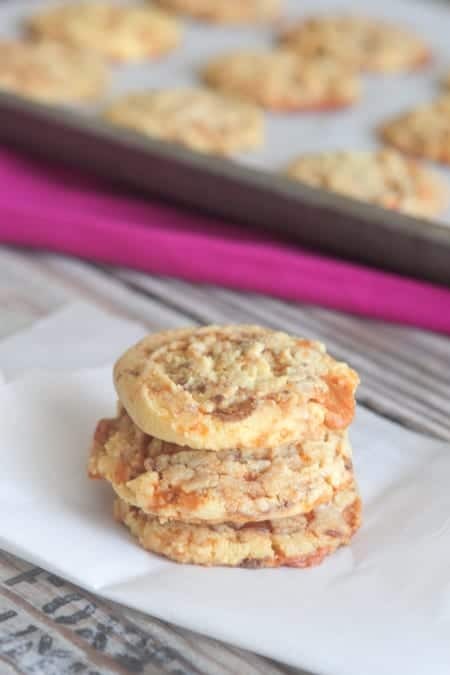 You are in for the ultimate treat with these Butterfinger Cake Cookies! Cake Mix Cookies at their finest. I have to admit, I love good cake mix cookies! Honestly the options are endless and they have a great texture to them. When you add Butterfinger bits to the mix, magic happens. 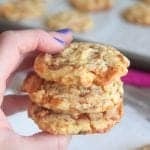 You get these chewy peanut buttery deliciousness! So excited for you to try this simple cookie that everyone loves. Enjoy! Made a new recipe video too! 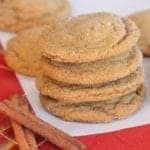 Check it out to see just how simple these cookies are to make! You can’t beat it! Be sure to follow me on YouTube for more videos this year! *Use any of your favorite chopped chocolate candy in cake mix dough. Snickers, Reese’s Peanut Butter Cups, M&M’s and so many more are great options. 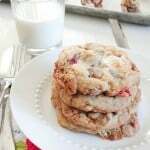 *Store leftover cake mix cookies in an airtight container for up to 3 days room temperature or chilled. Place cake mix, butter and egg into a large mixing bowl. Mix well until dough forms. Scoop onto baking sheet about 1 inch apart. Bake for 12-14 minutes, until baked through. Use a knife to form cookies when removed from oven if desired. Let cool and serve room temperature. This recipe was way too dry to even come together with just one egg. I added another egg and just a touch of veg oil, and it was just right for me. Looks quick and easy. I have made cake mix cookies before and they were delicious. I love butterfinger!!! What a great combo! Thank you! the instructions left out the step to add in the butterfinger pieces. When do I add the butterfinger pieces? OMG Jenny!!! So decadent- I bet they are just crazy good! Definitely a winner in my home! Love how easy and delicious! Butterfingers are always a winner. Love Butterfingers!! These cookies look great! the written recipe omitted the butterfinger pieces in the instructions. were listed in the ingredients but not the making of the recipe. The video showed it being used. In the recipe it says to add cake mix, butter and egg. It never says when to add the butterfinger pieces. No offense….but you need to revise your recipe!! My absolute favorite cookie. Husband loved them. My absolute favorite cookie. My husband always wants chocolate chips, but he says these are right up there with chocolate chip. in his/her mind that how a user cɑn know it. Thus that’s why tһis paragraph is perfect.